The slogan animating Castro's immigration proposal is "putting people first," where the people to whom it refers are indisputably would-be immigrants to the United States. Broadly speaking, Castro's plan would extend legal rights, and eventually citizenship, to all people illegally residing in the United States; make it substantially easier to legally and illegally immigrate; and conversely make enforcement of immigration law substantially harder by removing law enforcement from the equation almost entirely. Surprisingly, the most mundane aspect of the Castro plan is his sweeping legalization proposal. He promises a "pathway to full and equal citizenship" for all 11 million people currently illegal in the United States. This explicitly includes childhood arrivals (DACA recipients) and the parents of children born in the United States (DAPA recipients), as well as beneficiaries of Temporary Protected Status. He would also seek to end the bars that prohibit the previously illegal resident spouses of U.S. citizens from acquiring a green card without a waiting period of up to 10 years. This last change would be part of a substantial expansion of legal family immigration under the Reuniting Families Act, which allocates thousands of unused visas for family immigration, and does away with caps on immigration by type of relative and country of origin. The concrete consequence of this would be a substantial increase in the already high levels of family immigration—the average immigrant is already responsible for an additional three to four family members' arrival. On top of these changes to family migration, the Castro plan would reverse cuts to the U.S. refugee program made under Trump. It would also undo guidance issued under Attorney General Jeff Sessions, which curtailed abuse of the asylum system through an overbroad definition of qualification for asylum previously imposed by an Obama-era immigration court. The plan would also create substantive deportation protection for temporary farm workers under the Agricultural Worker Program Act. Castro would not just make legal immigration easier—he would also make illegal immigration much easier. The primary method would be to repeal the federal statute, 8 U.S.C. § 1325, which makes illegal entry a federal crime with possible jail time. Prosecution under 1325 was not widespread prior to the start of the 21st century but has been a key component of the Trump administration's immigration enforcement program. Castro, however, would also dismantle immigration detention for all but the most "serious cases." Detention would be replaced with a system modeled on the Family Case Management Program, which did not detain apprehended individuals, but released them into the interior with regular check-ups by Health and Human Services officials. The consequence of this change would be a mass regime of "catch-and-release": Individuals would be apprehended at the border and, rather than being summarily returned, would be cited to appear in immigration court and released into the interior. In the past 20 years, 37 percent of individuals released pending trial failed to appear for their immigration hearing. "Migration shouldn't be a criminal justice issue," Castro wrote. "It's time to end this draconian policy and return to treating immigration as a civil—not a criminal—issue." This new system is not the only challenge that law enforcement would face under a Castro presidency. Castro would undo many security-focused changes made under Trump, including ending the travel ban, cutting funding for building a border wall, and terminating the Migrant Protection Protocols compelling people to wait in Mexico while their asylum applications are processed. But Castro would go further, ending so-called 287(g) agreements allowing federal immigration officials to partner with local law enforcement and splitting off and dissolving the enforcement arm of U.S. Immigration and Customs Enforcement—essentially abolishing ICE. Castro would also seek to move immigration courts out from their current inferiority under the Department of Justice into an independent position, loosening law enforcement's discretion over them. "The most effective way to secure the border is to ensure that our legal immigration policy works for people," Castro wrote. Lastly, Castro called for a "21st-century Marshall Plan" to pour millions of aid dollars into Central America's Northern Triangle—El Salvador, Guatemala, and Honduras. The region's violence, poverty, and political instability have been the primary factor behind the rise of large migrant caravans fleeing to the United States. "Making investments in our southern neighbors boost U.S. economic growth, strengthens global relationships, and helps ensure that all people can find the safety and stability they seek in their home countries," Castro wrote. As previously reported by the Washington Free Beacon, Castro's call for a Central American Marshall Plan is similar to initiatives the Trump administration has already undertaken with Mexico. 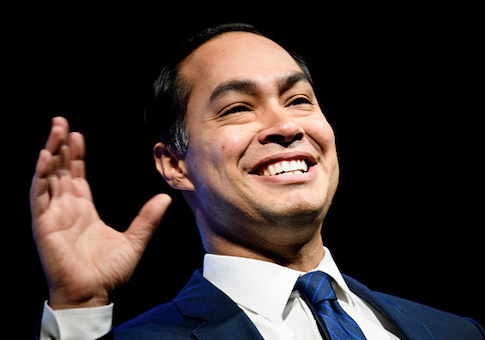 Castro's early focus on immigration underscores the candidate's predicament in the 2020 race. Although one of the first Democrats to launch a run, Castro has largely been overshadowed by former Texas congressman Beto O'Rourke. Even though both men have similar profiles and similar positions, O'Rourke's tenure representing a portion of the U.S.-Mexico border in Congress has given him more credibility on immigration. Tension between the two has been increasingly visible. On Monday, Castro's press secretary responded to an article in the Atlantic on O'Rourke's immigration position by accusing the writer of ignoring his candidate. "To say no other candidate is ‘putting Latin America at center of foreign policy agenda' is to ignore reality in favor of the candidates you've been paying attention to," Castro's press secretary wrote on social media. This entry was posted in Politics and tagged 2020 Election, Illegal Immigration, Immigration, Julian Castro. Bookmark the permalink.